Causes of indoor air pollution are cooking places with open fire, respectively the lack of access to modern energy. 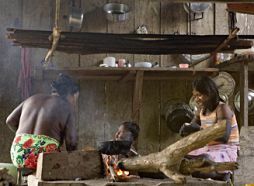 Affected people and foundations of life: About 2.4 billion people live in households in which women cook indoor using wood, dung, and other biomass. Another 0.6 billion use coal. (ITDG [Intermediate Technology Development Group] 2003; WHO [World Health Organization] 2002, 69, 226.) Findings from selected studies in affected homes are several times higher than the health related guideline values for airborne particulate matter (PM). They range from 60 µg/m3 (micrograms per cubic metre) to 4 800 µg/m3 of particles with less than 10 micrometres diameter (PM10) and 8 200 µg/m3 of particles with less than 2.5 µm diameter (PM2.5; WHO 2006a, 196). Deaths: 1.50 million people in 2002 – primarily women and children (WHO 2007 and 2002, 226). Loss of healthy life-years: 38.5 million healthy life-years in 2000 (DALYs [Disability-adjusted life years]; WHO 2002, 228). Targets/goals: Although there is still no agreed international target, there is a suggested target to reduce the number of people without effective access to modern cooking fuels by 50% until 2015 and make improved cook-stoves widely available (UNMP [United Nations Millennium Project] 2005, 30). From a global perspective, the potentially large health benefits from tackling indoor air pollution should be a policy priority (OECD [Organisation for Economic Co-operation and Development] 2008, 179). Trend: + Number of death cases has decreased between 2000 and 2002 from 1.62 to 1.50 million people (WHO 2007 and 2002, 226). Measures: The most important interventions are better ventilation, more efficiently vented stoves, and cleaner fuels (WHO 2002, 70). Appropriate stoves for nearly half of the world population would cost about US$ (United States dollar) 30 billion (ITDG 2003). 112 governmental and non-governmental actors have joined together in the Partnership for Clean Indoor Air (www.pciaonline.org). ITDG 2003 – Intermediate Technology Development Group – BBC (British Broadcasting Corporation) article by Alex Kirby: Indoor smoke 'kills millions'. November 28, 2003. UNMP 2005 – United Nations Millennium Project: Investing in Development; A Practical Plan to Achieve the Millennium Development Goals. Report to the UN Secretary-General. New York. WHO 2006 – World Health Organization: WHO Air quality guidelines for particulate matter, ozone, nitrogen dioxide and sulfur dioxide; Global update 2005; Summary of risk assessment. Geneva. WHO 2006a – World Health Organization Europe: Air Quality Guidelines; Global Update 2005; Particulate matter, ozone, nitrogen dioxide and sulfur dioxide. (ISBN 92 890 2192 6) Copenhagen. WHO 2007 – World Health Organization: Estimated deaths & DALYs attributable to selected environmental risk factors, by WHO Member State, 2002.